I attended the very busy opening of the new Manyat Peak Gallery in Porongurup on Wednesday. This is a brand-new, purpose-built studio gallery and owners Robert and Lorna Bunch hope to make it available for workshops and art tourism. Accommodation is available on the property in two new cottages. If you want easy access to the Lower Great Southern region, right on the doorstep of the magnificent Porongurup Range, give Manyat a call on (08) 9853 1174 and book yourself in for a few nights. I have a few works on display in this exhibition, along with pieces by several other artists. One notable exhibitor is Jessica Murray who, at 16 years old, is turning out spectacular work. If you haven't seen her landscapes, I suggest you seek them out. 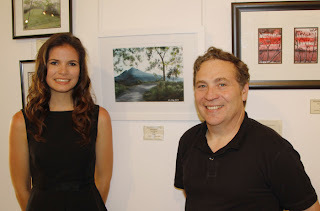 Jessica Murray and me, with some of Jessica's work. 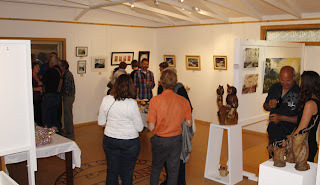 Thanks for posting this on your blog and for coming along and helping to make the evening a success. Morgan Freeman - finger painting or fake?